I’m sure that you remember the experiential activities that people do and the debate about the real and virtual world from the previous post. In order to understand discussions about real and virtual world more deeply, let’s use an example of the famous portrait of Lisa Gherardini, wife of Francesco del Giocondo, also known as the Mona Lisa. This well-known painting from 1503 by Leonardo di ser Piero da Vinci, known as Leonardo Da Vinci, has survived a long time, and most people can easily imagine how the painting looks. 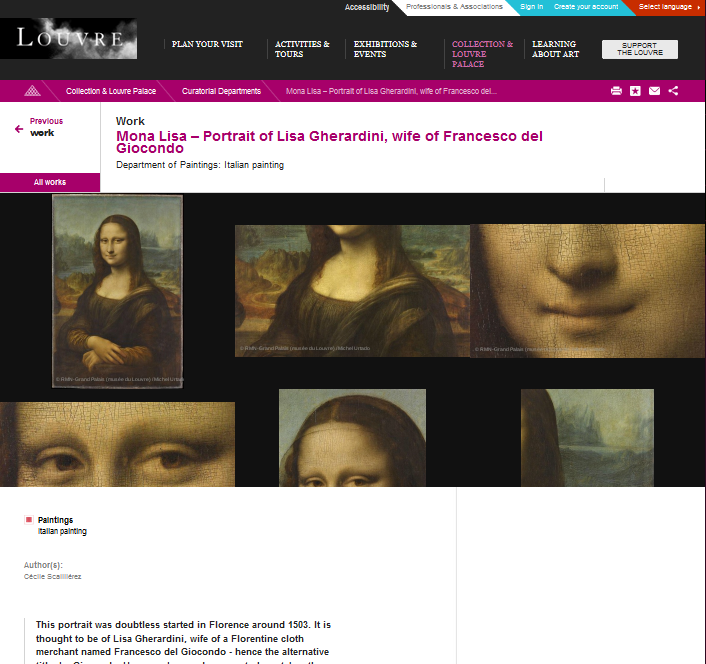 There is no secret that Lisa Gherardini was a real person and Leonardo di ser Piero da Vinc painted her portrait. Except the painting, there is no other visual materials left that can give us any clue to guess how Lisa Gherardini actually looks. In other words, Leonardo’s painting may have a value because it is the sole simulation of her. At the same time, we also value the painting as a real and genuine work of Leonardo. 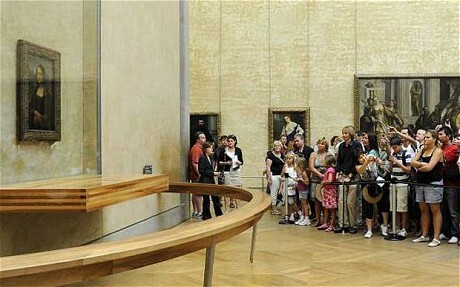 There are always people in line in front of the Louvre to see the Leonardo’s masterpiece. Even if there are tons of copies of it, since its copyright is under public domain, people want to see this real work of art. It is ambiguous whether people visit the museum to see the simulated image of Gherardini or the original masterpiece of Leonardo. This is a question that can not be answered easily, but it is clear that these people’s behaviors should be interpreted through the interactions among the object, painter, and the painted work that creates social meanings. Within these interactions, every object has their uniqueness whether or not they simulate something else. Now it is time to talk about later simulations for Leonardo’s famous painting. All of these replications provide us their unique experiences. His work is reproduced in books, movies (in fact, one of the movies was the secondary simulation of the painting from a book), digital copies, and even games. 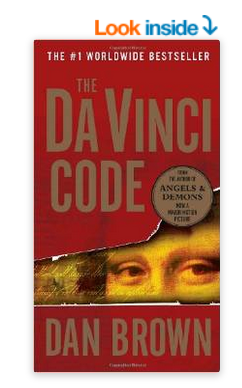 Da Vinci Code, which is a also well known book and movie, helps us to imagine a different social and historical context of the painting within a virtual world setting created by the author and director. Obviously, these types of media are not considered as VR or AR in general. This is not because they are telling about the real story or world, but they do not allow readers and viewers to modify the author and director’s world on books and movies, just like as we already discussed on the previous posting. How about digital copies of the painting on Louvre’s website? We can see the good quality digital copies with detailed explanations. You may able to see more close details about the painting on the website than at the museum. Websites are generally considered as an interactive media, and even if the interactivity is quite limited to specific abilities, such as selecting specific parts that we want to enlarge, it should be considered as a very elementary level of VR. 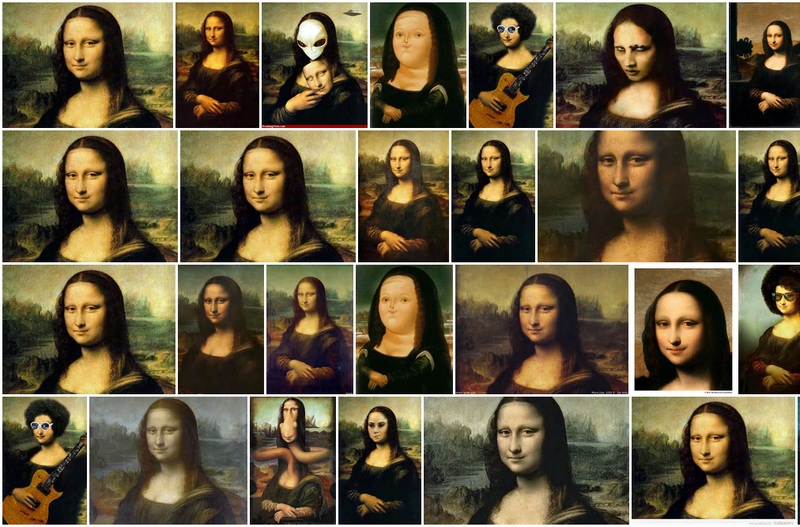 In addition, you can find games about the Mona Lisa at ampgames.com, girls.gamesxl.com, starsue.net. With these games you can try different make overs on the painting. You may apply some plastic surgery tools and accessories on the portrait with these games. You might feel uncomfortable for applying apply plastic surgery on her as I felt when you play one of the games. Both the model and painter of the art might also feel insulted by the game, so it might be fortunate that they can not see this game. 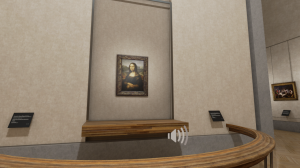 Anyway, this game also provides different experiences about the Lisa Gherardini and Leonardo’s painting for us, and the ability to change the content of the image depends on users’ selections. 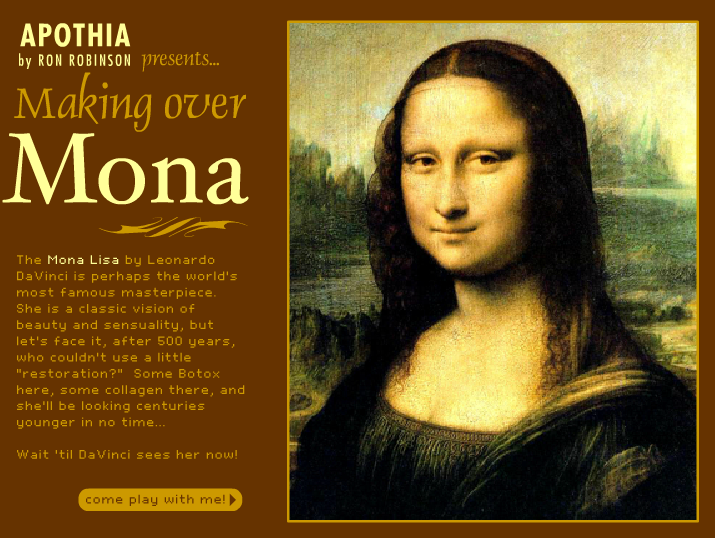 It tells us these games have better interactivity than the Mona Lisa on Louvre’s website. How about searching online search engines? As you may have already guessed, there are tons of copies of Leonardo’s painting over the Internet. 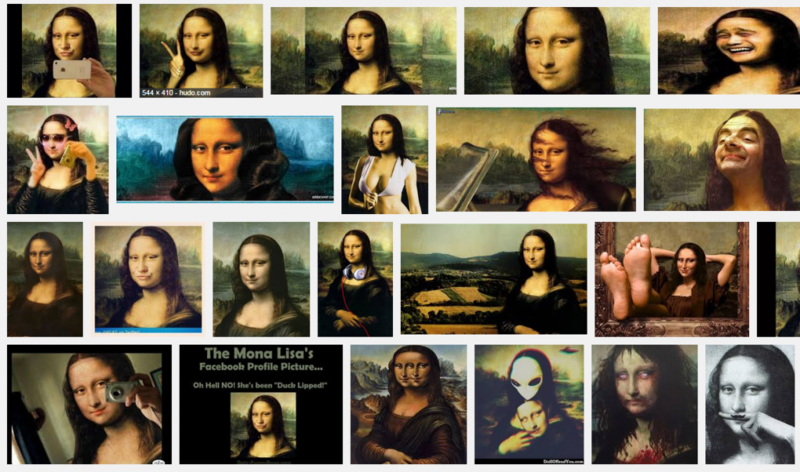 Let’s ask how search engines show us results about the Mona Lisa. As shown below, image search results (your search results may differ with mine) draw quite different results depending on their algorithms. Suppose we do not have any prior knowledge about the Mona Lisa as well as Leonardo’s painting, and ask yourself which of the results is more real and why we do think that one of the results is more real? This is an important question because we heavily rely on search results for questions that we have never heard. Although this is a complex problem, at least I can tell that this is also one type of very abstract form of virtual reality. Because search engines create the virtual world of image collections that matches a key word, so when you add or modify key words then the virtual world will have different shapes. Finally, here comes a HMD, what people generally consider as a typical VR. 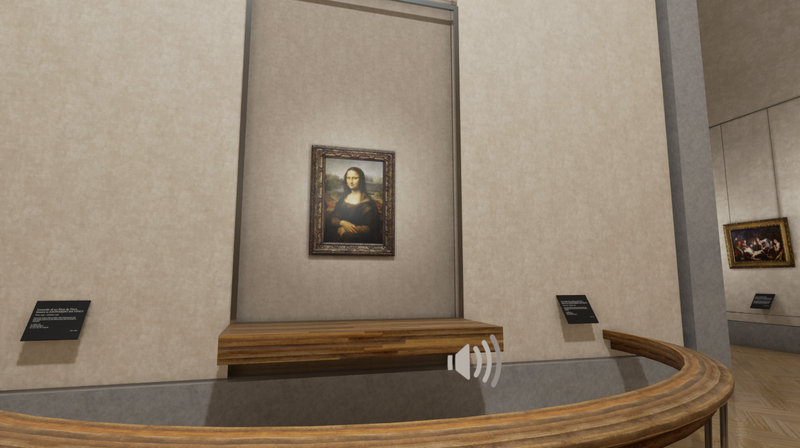 If you have Oculus Rift DK1 or DK2, you also can see the copy of the painting at the simulated version of Louvre museum in France where the painting is and where there are many people in line from all over the world just to see the Leonardo’s painting or painting of Lisa Gherardini. You can download the non commercial software when you visit this link. Even if it would be even better if the content has higher resolutions and quality graphics, (in fact, the graphic quality is quite good compare to other primitive VR programs), you can enjoy seeing the painting as if you were in the Louvre museum. This is more interactive than previous examples, because of the sense of (tele)presence that is evoked by the scenes that constantly reflect users’ responses to make people feel like they are in the Louvre museum. For example, you may stand in front of the Leonardo’s painting if you want, or walk around the museum as you please. Comparisons between two the experiences above will be interesting, but we will step aside practical and informational benefits of VR tour to the Louvre, such as a free admission and no waiting line for now. Now we can just focus on what people do and experience in both the VR version and so-called real experience, and try to see the lines between real and virtual. What we call simulated experiences are, in fact, different types of experiences that we can expand to. All of these experiences are on the continuum of artificial human constructs from Leonardo to you. The division between real and virtual are obviously arbitrary that based on human’s interests. At the same time, various types of mediated experiences for the famous painting reflect different social meanings and contexts that are linked to the paining. Therefore, we can have more affluent, not better or worse, senses of what these texts mean within the social interactions when we have more ample and various types of experiences from the same text. Even if you want to directly know about the famous Lisa Gherardini, the way you know about her is only delivered through Leonardo’s eyes, and social eyes that put the portrait on the Museum, and the developers’ eyes who created spaces that exhibiting the portrait. It comes finally to your perspectives of viewing. Special thanks to Jaclyn Partyka for visiting the museum wearing Oculus Rift.